The So You Think You Can Dance top 10 do their best to win votes to become America’s Favorite Dancer. available. I think he simply got tired of being humiliated on national TV. Joanna was not happy but don’t count her out yet. Like the proverbial bad penny, I have a feeling she’ll pop up again. Don’t miss Reality TV Magazine’s recap of America’s Got Talent here! Pete uses to play ping-pong with himself. Now that was fun. If you want something lighter than the usual crime drama this summer, you’ll want to check this new series out. 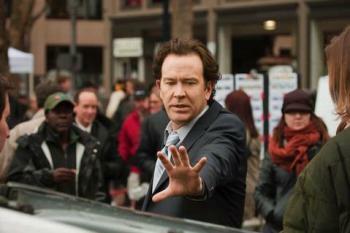 Tonight marks the return of one of my favorite shows — Leverage! It’s paired with a new drama called Dark Blue and I’ll have more on that in my Top Picks for Tonight. Top Ten compete for your votes tonight and from here on in it’s all up to you. Watch So You Think You Can Dance at 8:00 on Fox. of one member and this time it’s Eliot, Parker, Hardison and Sophie who have to drag Nate into the con. It’s the season two opener and you’re gonna love it. Watch Leverage at 9:00 on TNT. TNT newest original series takes you into the dark and muddy world of the deep undercover cop. the only woman on the team with tough guys Omari Hardwick and Logan Marshall-Green to do the heavy lifting. Warning: the show opens with an extreme torture sequence so viewer discretion is advised. Watch Dark Blue at 10:00 on TNT. The Superstars — Pictured: Jenn Brown, Joanna Krupa, Terrell Owens. Photo: ABC/Adam Larkey.